Aiseesoft iPad Transfer is the best iPad files Manager, which can help iPad users export music, movies, pictures, camera roll, voice memos, and camera shot on iPad to computer or iTunes, and import local video, audio and image files to iPad without losing anything. Also it enables you to convert popular video/audio files to iPad compatible formats, and then transfer those files to iPad directly. Moreover, it highly supports iPad mini 2, iPad Air, iPhone 5s/5c, iPod touch, iPod nano and iOS 7, iTunes 11, etc. Just connect two iOS devices(iPod, iPhone and iPad) to computer, and then this iPad Transfer can help users copy files from one to another. 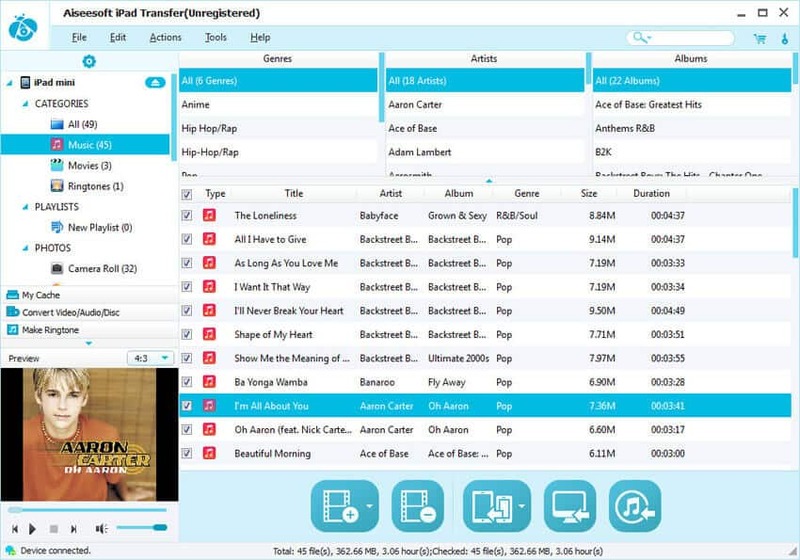 Aiseesoft iPad Transfer enables users to convert popular video/audio files to iPhone M4R Ringtone. This iPad Transfer supports: iPad mini 2, iPad Air, iPad mini, iPad 4, iPod, iPod classic, iPod nano, iPod nano 7, iPod shuffle, iPod touch, iPhone, iPhone 3G, iPhone 3GS, iPhone 5s/5c, iPhone 5 and iPhone 4S. If the iTunes database of your iPad has been damaged, this iPad Transfer can repair it automaticly. Aiseesoft iPad Transfer will auto-scan your iPad files, and sort these files by Name/Album/Artist/Genre, and then you can find your files more easily. The built-in player of Aiseesoft iPad Transfer allows users to preview the iPad video and photo effect.